Maypole MP956 - Hitch Lock for ALKO Hitches. Hitchlock for Alko hitches. For Alko hitches: AK130, AK160, AKS1300, AKS2004 and AKS3004. We at Bars4Cars specialise in roof bars, vehicles mats, wheel trims and other vehicle parts and accessories. Includes 70mm Disc Style Padlock. Universal Box Trailer Hitch Lock. Heavy Duty Steel Construction. Bright Red - Visible Deterrent. GREAT PRODUCTS. Order in the next. You're always in safe hands. Support for when you need it. Expands inside trailer coupling. Suitable for almost all coupling types. Universal Trailer Hitch Lock. Ideal for standard 50mm tow balls. Inserts and locks into the hitch. You're always in safe hands. KNOTT / AL-KO/ WINTERHOFF/ SPP/ BARREL LOCK. BARREL LOCK (HITCH LOCK) FIT FOR MOSTE AL-KO/ WINTERHOFF/ SPP AND KNOTT COUPULINGS SYSTEMS. Simply insert the barrel into the hole with the key then turn 90 degrees and remove the key leaving the barrel lock in the hole. 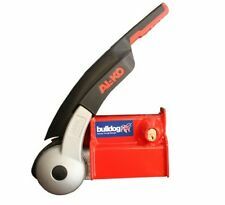 Bulldog GA95 ALKO Hitch Lock. WE ARE A BAILEY APPROVED AND MAIN DEALER AND HAVE BEEN FOR OVER 30 YEARS. WE ST OCK 90% OF ALL CARAVAN PARTS, CARAVANS & ACCESSERIES, ALON G WITH MANY OTHER MANUFACTUER CARA VAN PARTS/SPARES. 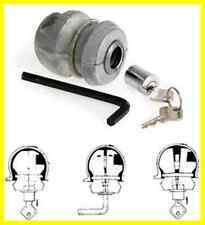 Designed to block all 50mm couplings, whether standard, braked or unbraked and including Al-ko and Winterhoff stabiliser heads, the Coupling Security Ball (also referred to as a Safety Ball) is used in conjuntion with a hitchlock to secure a trailer or caravan against unauthorised removal. Even where a hitchlock is used to prevent the coupling from attaching securely, if the hitch is left unblocked then thieves can use a ground down towball or hook to tow away hitchlocked caravans. The Security Ball prevents the caravan from being towed in this way. MAYPOLE ALKO HITCH LOCK MP956. For Alko hitches: AK130, AK160, AKS1300, AKS2004 and AKS3004. make Supersized seem small. Multipurpose use - can be used hitched or unhitched. Add to Favourites. Strong and robust. Here for sale a new but packaging has some marks on, Bulldog BRC/BK H/D hitchlock It fit braked trailer with a GA2750 or GA3500 Hitch head. I will send on a standard next day courier (England Wales) for quick delivery. Many thanks. Purpleline Saracen Knott Avonride Hitch Lock. The Saracen Knott-Avonride is designed to fit Knott-Avonride trailer hitches. Despite being designed specifically for Knott-Avonride hitches the Saracen Knott-Avonride can also be used as a generic hitch lock on a large number of other standard/pressed steel/cast trailer hitches up to 3500kg. Safe and secure (SAS) products Heavy duty lock for trailers with a 30 or 40mm towing eye rather than a 50mm ball coupling. Fully encloses eye coupling. Easy to fit. Clear visible deterrent Insurance approved. Supplied with 3 keys. Bulldog WW100B suitable for Winterhoff 3000H without latch and WS3000D without latch. Anti crop washers incorporated. High security drill and pick resistant lock. Hitchlock for Alko hitches. For Alko hitches: AK130, AK160, AKS1300, AKS2004 and AKS3004. In event of slight delay, your patience will be greatly appreciated. Lightweight and compact design (only 1.7Kg). For Alko hitches: AK130, AK160, AKS1300, AKS2004 and AKS3004. NEW MAYPOLE ALKO AK & AKS HITCHLOCK (SARACEN TYPE) AND A EXCELLENT CHEAPER BUY. Hitchlock for Alko hitches. Designed so that this hitch lock can be fitted with the caravan/trailer hitched to a towing vehicle or unhitched as required. For Alko hitches: AK130, AK160, AKS1300, AKS2004 and AKS3004. NEW MAYPOLE ALKO AK & AKS HITCHLOCK. Hitchlock for Alko hitches. Designed so that this hitch lock can be fitted with the caravan/trailer hitched to a towing vehicle or unhitched as required. The Bulldog minilock Winterhoff. Quick and easy to fit. 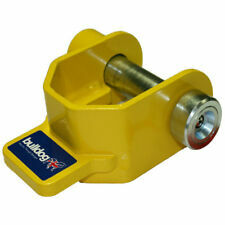 The Bulldog minilock range is also a well proven high security drill and pick resistant lock. Complete with dummy ball to restrict access to towing point. • For Alko hitches: AK130, AK160, AKS1300, AKS2004 and AKS3004. MAYPOLE ALKO. HITCH LOCK. • Easily fitted in under 10 seconds. • Lightweight and compact design (only 1.7Kg). • Strong and robust. Secures Commercial Trailers Palm Lock Trailers with palm coupling suzi line Secures Commercial Trailers by preventing the release of the brakes. Health & Safety, prevent unauthorised movement of trailers when loading/unloading. Fits all types of trailers with palm coupling suzi line. Easy and simple to use. Fitted and used by existing logistics companies. Helps prevent the theft of the trailer and its load. Easily stored. British manufactured and sold with Bulldog 5 year Guarantee. For plant machinery or generators Fits standard 30/40mm eyes Fully encloses eye coupling. Heavy duty construction. Maximum security lock. Easy to fit. Ideal for council property. FITS BRADLEY DOUBLE LOCK 3500 HITCH ONLY. SOLD SECURE APPROVED. FOR LOOP STYLE HANDLE ONLY. IN USED CONDITION SO WILL HAVE THE ODD CHIP SCUFF ETC. Remove key for added security whilst towing and when trailer is un hitched. Simply inserts into hitch. MP956 SECURITY - ALKO HITCHLOCK. Hitchlock for Alko hitches. For Alko hitches: AK130, AK160, AKS1300, AKS2004 and AKS3004. Fits Knott KQ14 hitch on P6E trailer 2004 Onward ONLY. "Practical Caravan's Guide to Security" said, "A clear Winner. Very sturdy indeed. I'd be happy owning one of these.". Use when hitched or unhitched. This Hitchlock is designed to fit to your Caravan or Trailer A-Frame Hitch Coupling to prevent unauthorised Hitching up. 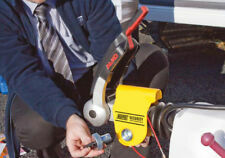 It prevents a Cars Hitch Ball from being inserted into your Caravan or Trailer Coupling on the A-Frame. !! Please note this is not suitable for A-frames fitted with Alko Type Stabilisers !! Material: Cast Alloy Body. Size (inch):1-7/8, 2 and 2-5/16. Security Kit for Trailer or Caravan Couplings. Brand: Toolzone. .
"Practical Caravan's Guide to Security" said, "A clear Winner. Very sturdy indeed. I'd be happy owning one of these.". Use when hitched or unhitched. Never use when towing. Norwich Union approved, anti-drill, anti-pick lock bolt. For 'Roll-on Roll off' skips. Yellow Finish Features: For use with 'Roll on Roll off ' skips. Simply lock in place over the lifting point to immobilise the skip. 25mm hardened steel locking bar with anti drill and pick lock. 3mm steel cover. Highly visible yellow powder coated finish. Supplied with 2 keys. 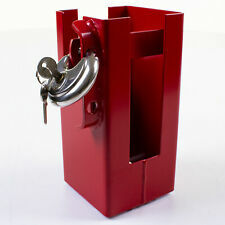 Prevent the theft of your skip/container with this high security RORO skip lock for use with 'Roll-on Roll off' skips. Fits most steel pressed couplings (SPP Knott Alko Maypole Erde Daxara Noval etc etc). Complete with hardened steel close shackle padlock and 2 keys. Steel coupling safe trailer coupling lock. Your goods will be dispatched on clearance of funds. Complete with hardened steel close shackle padlock and 2 keys. - Steel coupling safe trailer lock. Universal coupling safe. - Fits Al-ko, Knott, Winterhoff, Steelpress and most other open handled hitch types. Includes Stainless Steel Padlock with 2 keys. Locks towing pole/ coupling away to help to prevent theft when trailer/ caravan is stationary. Cycle Accessories & Parts (72). Cycle Maintenance/ Repair Kits (28). 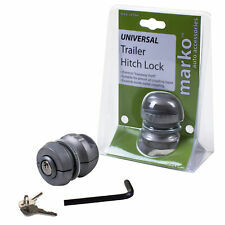 The Ball Lock is an anti-theft locking device that expands & locks inside the coupling of your trailer preventing the trailer from being connected to a Towball. 50mm BALL TRAILER LOCK. Fits all popular trailer couplings. Draper Professional Tool Range Solid Die Cast Steel Suitable For Trailers & Caravans (Fits Most 50mm Hitch Heads) Consists Of Ball Design & Steel Loop Design Dimensions: Approx . 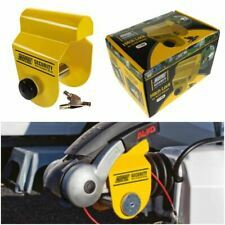 TRAILER CARAVAN HITCH LOCK 110 x 110 COUPLING LOCK YELLOW. BOAT TRAILER, BIKE TRAILER, PLANT TRAILER, UTILITY TRAILER, HORSE BOX, CARAVAN. 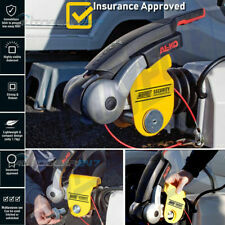 THIS IS A SECURITY HITCH LOCK THAT LOCKS OVER THE TOW HITCH OF YOUR TRAILER, CARAVAN OR HORSE BOX WHEN NOT BEING USE. MSA WHEELS AND CASTORS HAVE BEEN SUPPLIERS OF PALLET TRUCKS, PALLET TRUCK SERVICING AND REPAIRS, CARAVAN WHEELS, INDUSTRIAL WHEELS, CASTORS, TRAILER PARTS AND FORK TRUCK TYRES, AS WELL AS THE PRESS ON FITTING OF FORK TRUCK SOLID TYRES AND PRESS ON BANDS TO THE TRADE, INDUSTRY, AND THE PUBLIC SINCE 1998 AT OUR ROCHDALE DEPOT. These Hitchlocks have been engineered and designed to be the strongest Hitchlocks ever made. Super Heavy Duty 4mm steel combined with the strongest lock ever used in one of these products. Far exceed all standards for security. Visible security that obstructs the tow hitch. Suitable for most Steel tow hitches. Works with most types of couplings. Fits most 50mm Avonride cast heads from 1400Kg - 3500Kg including: 575003, 575004, 575005, 575008. Allows use of Avonride integral lock. The robust yellow steel casing with anti-saw features covers the fixing bolts of the hitch to protect it from being stolen. The hyperbolic lock core is designed to increase strength, provide low interturn rate, high strength soft rubber handle, avoid scratching steering wheel. The service life lasted for up to 10 years. Put another hook to lock the steering wheel. Stronghold Avonride hitch lock, fits the Avonride hitches. Maypole Stronghold SH5415 Hitchlock for Avonride Trailer Hitches. Fits most 50mm Avonride cast heads from 1400Kg - 3500Kg including: 575003, 575004, 575005, 575008. Fitting one of these makes it impossible for anyone else to hitch up to your trailer or caravan and steal it. 'Bulldog' Mini Trailer/Caravan Hitch Lock believed for Avonride 12-15851/14304.